The Resort of Fethiye is an extremely picturesque bay at the foot of the mountains surrounded by pine and cedar forests. You can see by the pictures that Fethiye is a popular place on the Turquoise Coast, sandy beaches, islands and mountains. But what you may not know is that Fethiye is the place to be for extreme sport such as paragliding white water rafting and diving. An extreme sporters paradise. Oludeniz is said to be the best site in Europe, possibly the World for paragliding. If you are brave enough to jump from Babadag Mountain (Father Mountain) you will experience the rush of a lifetime. For White Water rafting go to Saklikent (meaning Hidden City) it is around 50km from Fethiye and is well worth a visit. 18km long and 300 metres deep, you are able to walk the gorge, tickle fresh trout and white water raft, a great day out for all the family. But a word of warning as you walk one of the deepest gorges in the world hang onto your footwear. It is a common occurrence to see tourist flip flops bobbing past. These waters have claimed many items of footwear which will eventually end at Patara. 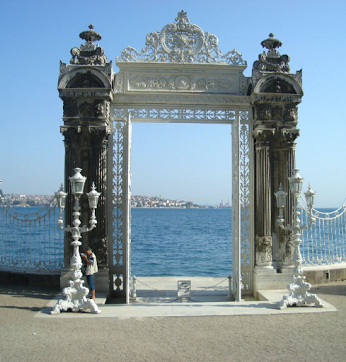 Dolmabahce Palace garden from the gateway to the sea. Patara is 11 miles West of Kalkan and is famous for its 12 mile long sandy beach. Don’t tell the kids but did you know that Santa Claus was born in Turkey? Saint Nic was actually born in Patara. The big guy was born in the 3rd century and became a priest working hard to reach the rank of Bishop. It is said that he would place gold in the shoes of anyone who left them for him to find and also gave much to the poor. So instead of jetting off to the North Pole come to Turkey full of history and much warmer.